Rehearing Denied May 21, 1984. Released for Publication June 7, 1984. Defendant appealed from an order of the Circuit Court, Gratiot County, Randy L. Tahvonen, J., affirming defendant’s conviction before the District Court, Robert M. Sheldon, J., of civil infraction of speeding. On remand from the Supreme Court for consideration as on leave granted, the Court of Appeals, J.H. Gillis, P.J., held that: (1) sworn traffic citation constituted sworn complaint for purposes of statute requiring sworn complaint to be filed when person denies responsibility for civil infraction; (2) defendant in civil infraction case could not refuse to give any testimony by asserting his privilege against self-incrimination; (3) due process did not require proof of each element of civil infraction by clear and convincing evidence; and (4) radar speedmeter evidence was inadmissible where patrol vehicle speedometer had not been calibrated independently of radar unit and where evidence indicated mathematical and physical impossibility of target vehicle being inside radar beam. **226 *529 Frank J. Kelley, Atty. Gen., Louis J. Caruso, Sol. Gen., Mark A. Gates, Pros. Atty. and Jeffery K. Riemersma, Asst. Pros. Atty., for the people. 530 Zolton Ferency, in pro. per. Before J.H. GILLIS, P.J., and SHEPHERD and KELLEY, JJ. This is an electronic surveillance case. People v. Gilbert, 414 Mich. 191, 197, 324 N.W.2d 834 (1982). Defendant appeals from a circuit court order affirming a district court judgment of responsibility for a civil infraction: namely, driving 65 miles per hour (m.p.h.) on a public highway with a speed limit of 55 m.p.h., M.C.L. § 257.629b; M.S.A. § 9.2329(2). The district court assessed a civil fine of $5.00, a judgment fee of $5.00 and $30.00 costs, for a total of $40.00. Defendant was issued the citation by Officer Eugene Flore of the Michigan State Police in North Star Township in Gratiot County at approximately 2:50 p.m. on May 31, 1981. Defendant’s speed was determined by the use of a radar speed detection unit while the unit was operating in the moving mode. Defendant denied responsibility and requested a formal hearing. At the close of the hearing, a judgment of responsibility was entered by the district court and subsequently affirmed by the circuit court. This Court initially denied leave to appeal. The Supreme Court, however, remanded the case “for consideration as on leave granted”. 417 Mich. 1071 (1983). On appeal, defendant raises four issues. The first issue raised by defendant on appeal is whether a sworn traffic citation filed with the district court constitutes a sworn complaint for purposes of M.C.L. § 257.744; M.S.A. § 9.2444. Officer Flore testified that he swore to the original citation later in the afternoon on the day it *531 was issued. This original citation was made part of the district court file. The district judge denied the motion, concluding that the sworn citation was itself a “sworn complaint” for purposes of the statute. The circuit court agreed. **227 Defendant argues, however, that, where a defendant denies responsibility for a civil infraction, M.C.L. § 257.744; M.S.A. § 9.2444 requires, in addition to the filing of the sworn citation, the filing of a sworn complaint before further proceedings may be had. Defendant contends that the conclusion of the courts below blurs any distinction between “citation” and “sworn complaint” when the Legislature intended the sworn complaint to be in addition to the citation. Accordingly, defendant argues, since no formal complaint was filed in this matter, the district court lacked jurisdiction to *532 proceed and the trial court’s decision must be vacated and the cause dismissed with prejudice. Section 727c of the Michigan Vehicle Code states that: “As used in this act, ‘citation’ means a complaint or notice upon which a police officer shall record an occurrence involving one or more vehicle law violations by the person cited.” (Emphasis supplied.) M.C.L. § 257.727c; M.S.A. § 9.2427(3). In this case, the police officer swore to the citation, which was thereafter placed in the district court file. Accordingly, a “sworn complaint [was] filed with the court”, M.C.L. § 257.744; M.S.A. § 9.2444, allowing the trial court to proceed with the formal hearing. Defendant argues that the citation was inadequate notice of the state’s civil infraction claim and that the only attestation appearing thereon was of service upon defendant. To the contrary, our reading of the citation reveals that Officer Flore, “being duly sworn”, listed the allegations against defendant in a clear and concise manner. Defendant was informed of the nature of the violation (i.e., “speeding”) and that the violation was a civil infraction. The citation indicated that defendant was to appear in district court “on or before ten days” following issuance of the citation. Finally, the date, time, and location of the alleged infraction were set forth. In short, the citation contains the facts “as are necessary reasonably to inform the adverse party of the nature of the cause he is called upon to defend”. DCR 111.1(1). Defendant’s next argument on appeal is that, in *533 a civil infraction case, a defendant may refuse to give any testimony by asserting his rights under the Fifth Amendment of the United States Constitution, U.S. Const., Am. V.
At the formal hearing, defendant objected to being called as a witness by the State, citing the Fifth Amendment to the United States Constitution. In effect, he asserted a right not to be called as a witness or to give any testimony whatsoever. The district judge ordered defendant to testify, finding the privilege inapplicable in civil proceedings. The trial court erred in concluding that the right against self-incrimination does not exist in civil litigation. “The privilege can be claimed in any proceeding, be it criminal or civil, administrative or judicial, investigatory or adjudicatory.” In re Gault, 387 U.S. 1, 47, 87 S.Ct. 1428, 1454, 18 L.Ed.2d 527 (1967) quoting from Murphy v. Waterfront Comm of New York, 378 U.S. 52, 94, 84 S.Ct. 1594, 1611, 12 L.Ed.2d 678 (1964) (White, J., concurring) (Emphasis in Gault ). “[T]he right to remain silent is constant and exists at all times.” People v. Cade, 125 Mich.App. 196, 198, 335 N.W.2d 653 (1982). Nevertheless, merely because witnesses in any proceeding have the Fifth Amendment right does not entitle them to refuse to testify at all. “A civil infraction action is a civil action.” M.C.L. § 257.741(1); M.S.A. § 9.2441(1). As a party to a civil action, defendant must be distinguished from an accused in a criminal proceeding who has the right not to take the stand. Defendant thus “has only the privilege of not giving an incriminating response to any inquiry put to him”. People v. Guy, 121 Mich.App. 592, 609, 329 N.W.2d 435 (1982). He “has no occasion to invoke the privilege against self-incrimination until testimony **228 sought to be elicited will in *534 fact tend to incriminate”. Brown v. United States, 356 U.S. 148, 155, 78 S.Ct. 622, 627, 2 L.Ed.2d 589 (1958); Meyer v. Walker Land Reclamation, Inc., 103 Mich.App. 526, 532, 302 N.W.2d 906 (1981). In this case, the State did not seek to elicit any *535 criminally incriminating responses from defendant. The State’s attorney asked questions relating solely to defendant’s responsibility for the civil infraction. His rights under the Fifth Amendment were not infringed. Defendant next argues that due process requires that the state prove each element of the offense by clear and convincing evidence and not, as in the instant case, by a preponderance of the evidence. Defendant contends that any other standard deprives citizens of the last shred of fundamental fairness and militates against the transfer of traffic offenses from criminal to civil proceedings: it is one thing to deny the citizen a trial by jury, but it is still another to denigrate the standard of proof from beyond a reasonable doubt to the level of mere balancing of speculation and conjecture. Under M.C.L. § 257.747(5); M.S.A. § 9.2447(5), “If the judge determines by a preponderance of the evidence that the person cited is responsible for a civil infraction, the judge shall enter an order against the person”. (Emphasis supplied.) Defendant cites no authority for the proposition that application of this standard of proof in a civil infraction case violates the due process clause. The State may establish the burden of persuasion and burden of proof in civil actions unless “it offends some principle of justice so rooted in the traditions and conscience of our people as to be ranked as fundamental”. Patterson v. New York, 432 U.S. 197, 201-202, 97 S.Ct. 2319, 2322-2323, 53 L.Ed.2d 281 (1977), quoting Speiser v. Randall, 357 U.S. 513, 523, 78 S.Ct. 1332, 1340, 2 L.Ed.2d 1460 (1958). A standard of proof “serves to allocate the risk of error between the litigants and to indicate the relative importance attached to the ultimate decision”. Addington *536 v. Texas, 441 U.S. 418, 423, 99 S.Ct. 1804, 1808, 60 L.Ed.2d 323 (1979). The United States Supreme Court has weighed the extent of the individual’s interest against the state’s interest in a particular burden of proof in order to decide what standard is appropriate. **229 Addington, supra, 441 U.S. 425, 99 S.Ct. 1809. Only where a fundamental liberty interest was at stake has the Court held application of the “clear and convincing” standard constitutionally required. See: Santosky v. Kramer, 455 U.S. 745, 102 S.Ct. 1388, 71 L.Ed.2d 599 (1982) (parental rights termination proceeding); Addington, supra (involuntary commitment of the mentally ill); Woodby v. Immigration & Naturalization Service, 385 U.S. 276, 285, 87 S.Ct. 483, 487, 17 L.Ed.2d 362 (1966) (deportation proceeding). In this case, defendant was held responsible for a civil infraction and ordered to pay a small fine and court costs. The deprivation suffered pales in comparison to the “particularly important individual interests” which the Supreme Court has deemed entitled to enhanced protection. Addington, supra, 441 U.S. 424, 99 S.Ct. 1808. Given the weight of the private and public interests involved, it cannot be said that the traditional “preponderance of the evidence” test is violative of due process. Defendant’s final argument on appeal is that the issuing officer’s failure to adhere strictly to the “Interim Guidelines for the use of Radar Speed Measuring Devices” constitutes a violation of the due process guarantees contained in both the federal and state constitutions, U.S. Const., Am. V; Const.1963, art. 1, § 17. Defendant contends that less than strict compliance with these minimum guidelines is a violation of due process because use of the guidelines has been occasioned by the need to be fair and accurate in the application of radar. The need to have minimum standards has been *537 emphasized by courts in other jurisdictions. Defendant urges this Court to follow their lead and adopt the Interim Guidelines or a substantial equivalent. Defendant argues that, in the instant case, the guidelines were clearly violated in several critical instances: the patrol vehicle speedometer was not tested independently of the radar unit, and defendant was in a cluster of traffic and, under the guidelines, the officer should take no enforcement action if there is any doubt as to target identification. In addition, defendant points out that the evidence indicates the mathematical and physical impossibility of defendant’s automobile’s being inside the radar beam at the time the speed reading was taken. Finally, defendant challenges the issuing officer’s competency to testify on the basis that the officer had no classroom training in the use of radar. We agree with defendant that due process requires adherence to some standards before radar speed evidence can be admitted against a defendant at trial. “For the average law abiding American citizen, minor traffic offenses constitute the only contact such a person will have with the law enforcement and judicial systems. Public confidence rests upon the fairness of such proceedings. Until a radar device is invented that is accurate under any conditions, fairness dictates that contested prosecutions are conducted according to meaningful standards which insure the instrument’s accuracy.” State v. Hanson, 85 Wis.2d 233, 246, 270 N.W.2d 212 (1978). The formation of these standards, however, is a more difficult question which has not previously been addressed by the courts of this state. *538 The Supreme Court has discussed radar speed detection in the context of a criminal prosecution for possession of a radar speed detection device. “It appears that the technology may have already advanced to the point where a radio beam can be directed to hear conversations within an automobile. Or the police might surreptitiously install a radio device on an automobile to monitor conversations within the automobile. The police might install an electronic device at a gate or field to identify automobiles entering the area. “Persons who wish, by installing electronic detection devices, to protect themselves **230 against such police intrusion and surveillance may not be violating any law but merely fearful that their activities, political and not criminal, have come to the attention of the authorities. “Electronic surveillance by the police is serious business and an intrusion into the privacy of anyone who is subjected to it. Because defendant does not challenge the actual use of the radar speedmeter but the manner in which it was used, we do not address this issue. *539 We begin our discussion by limiting our topic to what standards should be applied in “moving radar” cases: that is, where the vehicle in which the radar speed detection unit (unit) is moving, i.e., being driven down the road as opposed to remaining in one spot (stationary mode). The units themselves have not been subject to any performance standards. “1. The officer operating the device has adequate training and experience in its operation. “2. That the radar device was in proper working condition at the time of the arrest. This will be established by proof that suggested methods of testing the proper functioning of the device were followed. “3. That the device was used in an area where road conditions are such that there is a minimum possibility of distortion. “5. That the speed meter should be expertly tested within a reasonable proximity following the arrest and that such testing be done by means which do not rely on the radar device’s own internal calibrations.” Hanson, supra, 85 Wis.2d p. 245, 270 N.W.2d 212. Although defendant had directed this Court’s attention to the standards set forth in Hanson, defendant urges this Court to recognize, as a minimum *542 standard, the Interim Guidelines for the Use of Radar Speed Measuring Devices promulgated by the Office of Highway Safety Planning of the Michigan Department of State Police. These guidelines, first distributed throughout the criminal justice system in December, 1979, are the work of a task force which included members from the Michigan Association of Chiefs of Police, Michigan Sheriffs’ Association, Michigan State Police, Michigan Law Enforcement Officers’ Training Council, Michigan State University, State Prosecuting Attorneys’ Coordinating Council, District Judges’ Association, and the Office of Highway Safety Planning. Although not mandatory on any law enforcement unit, the guidelines were distributed to enhance the use of radar in Michigan as a tool for law enforcement. We do not quote these guidelines here because we decline defendant’s invitation **232 to adopt them as the minimum standard. Instead, we have devised a hybrid set of standards based on those set out in Hanson and the Interim Guidelines. The officer operating the device has adequate training and experience in its operation. That the radar device was in proper working condition and properly installed in the patrol vehicle at the time of the issuance of the citation. *544 5. That the speedmeter be retested at the end of the shift in the same manner that it was tested prior to the shift and that the speedmeter be serviced by the manufacturer or other professional as recommended. **233 6. That the radar operator be able to establish that the target vehicle was within the operational area of the beam at the time the reading was displayed. That the particular unit has been certified for use by an agency with some demonstrable expertise in the area. These guidelines can be met by a showing that the issuing officer followed the recommendations contained in the Interim Guidelines and other recommendations issued by the Office of Highway Safety Planning. We recognize, also, that there may exist other agencies or organizations with a demonstrable expertise in this area which promulgate similar guidelines which may be used to show that the above guidelines have been met. The patrol vehicle speedometer had not been *545 calibrated independently of the radar unit, in violation of guideline number 4. The evidence indicates the mathematical and physical impossibility of the target vehicle being inside the radar beam, in violation of guideline number 6. We feel this point requires further explanation. At trial, Officer Flore testified that US 27 is a four-lane highway with a center median. The lanes are each 12 feet wide and the median is approximately 35 to 40 feet wide. Officer Flore was travelling in the northbound passing lane when he first observed defendant travelling in the southbound passing lane at what appeared to him, by visible observation, a speed in excess of the speed limit. Using the Decatur MV-715A unit installed in his patrol car, the officer determined that defendant was travelling at 67 m.p.h. and the patrol vehicle was travelling at 53 m.p.h. The officer’s initial observation of defendant was at a distance of 750 to 900 feet. The officer observed defendant’s vehicle for 4 or 5 seconds before operating the radar unit. In his defense, defendant called Dr. Dennis Bryde, a law enforcement specialist with Michigan State University. The trial judge allowed Dr. Bryde to testify as an expert on the use of radar. Dr. Bryde testified that the width of the radar beam is approximately 18 degrees. Using the figures supplied by Officer Flore, Dr. Bryde computed the closing speed between the two vehicles to be 120 m.p.h. or 176 feet per second. After four seconds, the vehicles would have been 196 feet apart (900 feet less 704 feet); after five seconds, they would have been only 40 feet apart. At neither of these distances would defendant’s vehicle have fallen within the radar beam from Officer Flore’s unit. *546 Defendant also contends that Officer Flore was not properly trained. With this we cannot agree. Although Officer Flore did not receive the type of training recommended by Dr. Bryde, Officer Flore consistently passed a certifying exam adapted from an examination prepared by Dr. Bryde. The finding of responsibility against defendant is reversed. Reversed. No costs, a public question being involved. James J. Kelley, Jr., 38th Judicial Circuit Judge, sitting on Court of Appeals by assignment pursuant to Const.1963, Art. 6, Sec. 23, as amended 1968. “Radar speed-measuring devices operate on the well-known Doppler principle, which relates the frequency shifts in reflected radiation to the relative velocity between the reflecting object and the observer. Existing radar devices transmit a continuous signal at either 10.525 GHz in the X band or 24.15 GHz in the K band, and they analyze the reflected signal for frequency shifts that indicate the speed of vehicles in the path of the beam. Each mile per hour of target speed produces a frequency shift of 31.4 Hz with the X-band frequency or 72.0 Hz with the K-band frequency. “The radar device mixes the incoming signal with a portion of the unshifted signal to obtain the frequency shift as a beat frequency, or a series of frequencies if a number of targets are within the beam. A processor then selects a target from among the various return signals. How this is done varies somewhat from device to device but, most typically, the processor will select either the strongest or the fastest return signal, depending on the relative strengths of the two. A phase-locked loop then ‘locks onto’ this target and feeds its frequency shift into a digital display that is calibrated in miles per hour. Simultaneously, the amplified frequency shift of the signal, or a synthesized signal of the same frequency, is fed into a speaker. The shifts are in the audio range-for example, 1884 Hz for a 60-mi/h-vehicle when the X band is used. “If the radar device is operated in the moving mode-that is when the police car is itself moving-an additional circuit function acts to determine and subtract out the speed of the police vehicle. The device takes the strong ground-return signal bouncing off objects close to the highway as a measure of the Doppler shift created by the police vehicle’s own motion, subtracts the resulting velocity from that of the target vehicle, and feeds the result into the digital display as target velocity. Typically, in the moving mode, the officer is searching for violators in the opposite lanes. Those in his own direction can be just as easily detected by pacing them.” Fisher, Shortcomings of Radar Speed Measuring Devices, IEEE Spectrum, Dec 1980, p 29 [hereinafter Fisher]. “The accuracy of radar devices as they have been used to enforce speed laws on roads in the United States is being questioned. Well-publicized court rulings-such as last year’s State of Florida v. Ana Aguilera [sic] ruling-have found radar speed readings inadmissible as legal evidence, because the radars were operated in such a way as to cast doubt on the accuracy of the readings. “Yet existing devices are, in fact, quite accurate if used within their limitations by trained operators. The current problems can be overcome through better training and tighter equipment standards, while some relatively simple technical improvements in the radars can significantly reduce present limitations.” Fisher, supra, p 29. See also Trichter & Patterson, Police Radar 1980: Has the Black Box Lost its Magic? 11 St. Mary’s LJ 829, 831 (1980) [hereinafter Trichter] and the sources cited therein. See Comment, Radar Speed Detection: Homing in on New Evidentiary Problems, 48 Fordham L Rev 1138 (1980). As explained in Section IV of the Interim Guidelines, radar readings can be affected by a number of factors. The following list is not meant to be exclusive. Verification by means of the radar unit is not sufficient. Conversely, the verification of the radar unit using a speedometer not independently calibrated is also not sufficient. Both amount to “bootstrapping” the accuracy of the unit. The Interim Guidelines require independent calibration. “In testing a moving radar unit the patrol car’s speedometer is measured against the digital display of the ‘low radar.’ When this low radar reading and the patrol vehicle’s speedometer are the same, the radar is said to be operating accurately. “Criticism: Automobile speedometers are not inherently error free. Authorities estimate the margin of error at about seven percent. When a vehicle’s tires have been changed to either a smaller or a larger size the speedometer must be recalibrated, otherwise the vehicle speedometer fails to measure the true speed of the vehicle. When the speedometer of the pace vehicle is malfunctioning or there has been a tire size change without subsequent recalibration, an error in the radar unit may go undetected if the radar’s error is identical to the speedometer error.” [Footnotes omitted.] Trichter & Patterson, supra, pp. 845-846. The National Transit Database site has been updated with February 2018 data. In looking at most cities in Michigan, transit ridership continued to decline. For instance, February ridership in Grand Rapids, Detroit, and Kalamazoo all declined by over 8%. Ann Arbor saw a decline of about 2%, and Lansing saw an increase of just over 1%. The Detroit Free Press also ran a story today, using my NTD site, and pointed out that the Detroit People Mover costs over $25 million to operate (and consequently loses nearly $10 per rider). The Mackinac Center has been running a series of stories, using my site and its data. Oh, and the Detroit People Mover’s ridership declined about 40% in February. Interestingly, the Detroit People Mover’s average trip length is 1.4 miles. 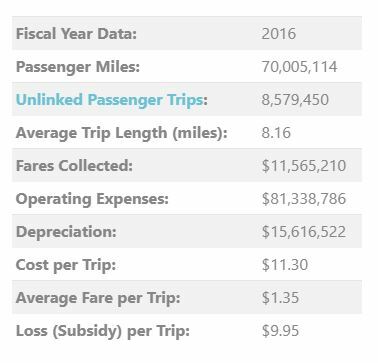 The average cost to taxpayers of each trip is $9.95. How much is a 1.4 mile uber ride? A federal judge unsealed the source code for a software program that was used to compare DNA samples in New York City’s crime lab. In July 2016, Judge Valerie Caproni of the Southern District of New York determined in U.S. v. Johnson that the source code of the Forensic Statistical Tool, a genotyping software, “is ‘relevant … [and] admissible’” at least during a Daubert hearing—a pretrial hearing where the admissibility of expert testimony is challenged. Caproni provided a protective order at that time. This week, Caproni lifted that order after the investigative journalism organization ProPublica filed a motion arguing that there was a public interest in the code. ProPublica has since posted the code to the website GitHub. A U.S. Senate panel on Wednesday unanimously gave the green light to a bill aimed at speeding the use of self-driving cars without human controls, a measure that also bars states from imposing regulatory road blocks. The bill still must clear a Senate vote, but it appears on track to passage. This should rev up profits for automakers, technology companies and ride service providers, hastening the day when their robot cars can carry passengers on the same U.S. roads as cars driven by people. Tiny-house buyers have to cope not only with the challenges of living in a smaller space. There are also zoning regulations that make it difficult to find a spot for the homes. In densely populated areas and most other areas, zoning regulations typically don’t allow full-time living in temporary structures such as RVs or movable tiny houses, the New York Times reports. The zoning laws also may specify a minimum lot size that it too expensive for a tiny-house buyer. Some municipalities—including Fresno, California, and Nantucket, Massachusetts—have changed their zoning laws to accommodate homes that share land with existing homes. In another nod to the tiny house movement, the International Code Council has adopted a model code for such structures.